At least four thousand years ago, but very likely even earlier, the Eskimos crossed the Bering Straits when the tribes migrated East from the cold barren lands of Siberia. Arctic anthropology indicates the presence of Eskimo civilization at Cape Krusenstern as early as 1850 B.C. Eskimo means “raw flesh eater” in the language of the Canadian Indians, the Eskimos referred to themselves as “Innuit” which means “the people.” Culturally they are quite different from the other races in the New World; their history is mysterious and much of this surrounds the dog. Thus its history and early development are largely conjectural. Early life for the Eskimo consisted of nomadic travel in extremely rigorous conditions. Dogs and sleds were essential to their way of life and were their most prized possessions. Without them travel and hauling would have been impossible. Archaeological evidence indicates that sled dogs may have first been used no more than three to five hundred years ago, although they may have been used for dog-drawn sleds or as pack dogs before that time. The dogs also hunted polar bear and other Arctic mammals for food. They are extremely hardy dogs and have adapted to the extremely low temperatures commonplace in Alaska. One thing is certain – the innate quality of the dog we know as the Alaskan Malamute and its superb adaptation to its environment. There are twenty native Alaskan languages, four are Eskimo. However, none were written down until the eighteenth century when Russian fur traders entered the country. The name Malamute applies to the regional dialect of the Alaskan Inupiaq Eskimos. The Malamute speaking tribe or tribes eventually settled in the Northeastern area of the Seward Peninsula. It was here that the dogs we call Alaskan Malamutes are popularly supposed to have originated or to have settled after the great migration. Some early explorers also described similar dogs in coastal regions much further South. Obviously men and their dogs migrated to where there was most food. Fishing and game possibilities varied according to the weather and coastal areas may have had more to offer. This accounts for the apparent spread of the dog population to both North and South from the original settlements around Kotzebue Sound. Nonetheless, Malamute dogs of excellent type could be found in that area even up to the mid-1960’s. Malamute Eskimos, now known as Kuuvangmiut or Kobuk people, had a good standard of life, working hard and developing their dogs to a high level of strength, intelligence and reliability. 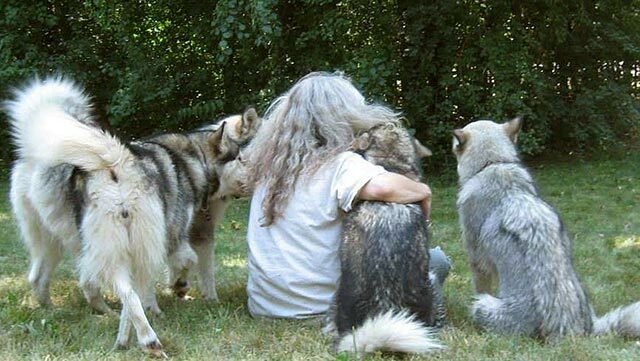 People of the Malamute region are said to have fed dogs as often as they themselves ate on the trail. This humane treatment may account for the rather better temperament of the Alaskan Malamute as opposed to certain other Arctic sled dog breeds. When you consider that many working dogs were badly mistreated, underfed and over-used it should not be surprising that many Arctic dogs had bad dispositions. The Malamute Eskimos bred only the best and most promising youngsters and treated their dogs well and evidently did not do a lot of breeding because of the lack of food. White men found it difficult to purchase Malamutes because of the high value placed upon them which explains the relatively small foundation to which we trace today’s Malamutes. When the Gold Rush began in 1896 prospectors discovered the need for sleds and dog teams. Teams became very expensive; it was normal to pay $1,500 for a small team and $500 for a good dog. The Alaskan Malamute was the most prized and respected team dog and his facial markings were much admired. However, the Alaskan Malamute breed could have been lost during this time of inter-breeding with smaller, faster dogs for racing and also with larger dogs such as the Saint Bernard for dog fighting and weight pulling. Despite this cross-breeding, the dogs quickly began to return to the Spitz type to which all Northern breeds belong. Even the first generation of cross-breeds tended to look more like the Spitz dog than the other half of their breeding. Within three generations there would be no sign of outside blood. Why would this be so? The Arctic type has been dominant for many centuries and obviously those dogs not inheriting the survival characteristics of the Arctic breeds would not be able to survive. Additionally, many Arctic dogs are “easy keepers” and require much less food than dogs of comparable size. It has been speculated that those dogs that did not inherit these qualities may well have starved on the rations normally given to the sled dogs. These differences can partially account for slight variations found in modern Alaskan Malamutes. They do not indicate any impure breeding in present day dogs, nor any departure from true type. Kotzebue — The Kotzebue line stemmed from Arthur Walden’s dogs which were taken over by Milton and Eva Seeley when Mr. Walden went to Antarctica. The Seeleys’ Chinnok Kennels in Wonalancet, New Hampshire was the best-known sled dog headquarters in the United States. Dogs for both of the Byrd Expeditions and for the United States Service Expedition (all to Antarctica) were trained and supplied by Chinook Kennels. The Seeleys deserve much of the credit for getting the AKC to recognize the Alaskan Malamute. M’Loot — Paul Voelker originated the M’Loot line that figures strongly in many pedigrees, including the foundation of Silver Sled Kennels that is behind most of the Alaskan Malamutes you may find in the Midwest. Although Voelker was interested in the same breed, he came up with a slightly different type of Alaskan Malamute but did not pursue AKC registration. Hinman (or Hinman-Irwin) Strain — This strain involved only a few dogs but made important contributions to breed quality. The Hinman line in combination with the M’Loot strain produced some of the best representatives of the breed. The Hinman strain also figured strongly in combination with M’Loot and Kotzebue in development of the “Husky-Pak” line, and produced many champion and foundation dogs for the breed. Breed recognition for the Alaskan Malamute came in 1935, the same year that the Alaskan Malamute Club of America was formed. The original registration period for AKC was very short, just long enough to get enough dogs registered to provide a base on which the breed could grow and develop. During World War II, many sled dogs, including many of the few registered Malamutes, were loaned for war duty. After the war many of these same dogs were used on an expedition to Antarctica. They served and then, due to some bureaucratic decision, were chained to an ice floe and destroyed by an explosive charge (this action nearly incited a mutiny among the Navy men involved). Some time after this tragic event, AKC realized the breed had hardly any registered Malamutes to support it. They reopened AKC registration, but on more rigid specifications. Quality had to be proved by showing each applicant as a “listed” dog and attaining ten championship points. During this time, many early fanciers registered their dogs under the new rules, adding the M’Loot and Hinman strains to the Kotzebues registered earlier. Suddenly, the door to registration was closed by the AKC despite the protests of the Alaskan Malamute Club of America. All registered Alaskan Malamutes today go back to the original Kotzebues or to dogs registered during the open period in the late forties. In closing, I would like to include a quotation from Natalie Norris, an early Alaskan Malamute fancier and one of the best-known women sled dog racers. (I LOVE THIS QUOTE!) “The Malamute is too fine and distinguished a breed to be changed into anything but what centuries of adaptability to its environment has produced. Our efforts should be to breed not only beautiful Malamutes, but as good specimens physically as were originally found in Alaska. It isn’t a question of breeding a better Malamute, but as good an Alaskan Malamute.” Contact the Corresponding Secretary or Web Site Committee.